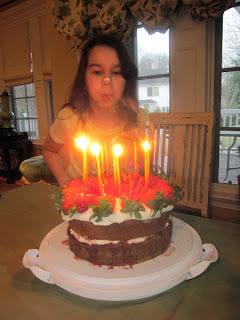 I Was Born To Cook: Happy Birthday Maddie! My oldest niece and goddaughter turned 10 yesterday. Seems like last week that I was at the hospital about to witness her birth (until my sister had to get wheeled in for an emergency C-section and I was kicked out...boo!). She's made me a proud Aunt since the day she came into my life. A few weeks ago I asked Maddie what kind of cake she wanted me to bake for her big day. She didn't hesitate for a second before answering, "Strawberry Shortcake!". So, that was that...off I went to search for a recipe. Well, it didn't take long for me to find a fantastic one for the cake and strawberry filling. Conveniently, it was also for 9 inch cake pans, which was perfect for me since I don't have 8 inch! 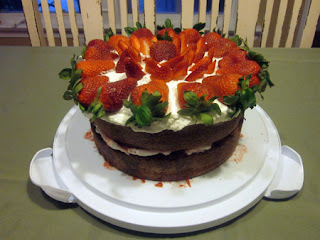 I chose to use my sweetened whipped cream instead of cream cheese frosting for a more traditional strawberry shortcake. The end result was wonderful...both in the looks and taste department. DELICIOUS. Say whaaaaa??? Yes, I had to Google. Here's a tip - Amazon. If you have a 10 year old girl you need to buy a gift for, go there, and pick up 5 of them. She'll love you forever. 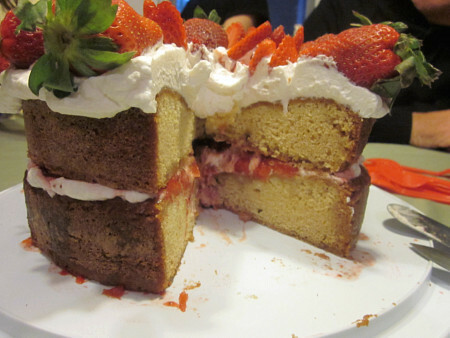 To make the strawberry filling - wash, stem and slice the berries lengthwise. Put them in a bowl with 3 tablespoons of sugar, stir, and set aside for 30 minutes. Mash the berries with a fork, then add another 1-2 tablespoons of sugar, stir, and let sit until all sugar is dissolved. Mash the larger pieces and set aside. Once cakes are completely cooled, start by placing one on a plate and topping it with some of the sweetened whipped cream (see my recipe below)...just enough to cover the cake...followed by all of the strawberry filling. Make sure to pour all of the juice on it too!